Come to Jessica Jane Robinson’s official public book signing which will be the first in a series of ongoing creative community “Stone Soup” Events on Thursday nights at Julie’s Coffee & Tea Garden. 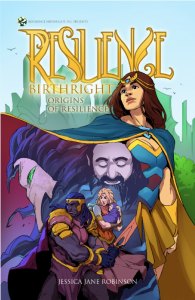 The Resilience Birthright graphic novel stories are inspired by the 10+ years of experience Ms. Robinson has collected as a Climate Leader under Former VP Al Gore, helping the City of Alameda, other Bay Area communities, schools, and organizations address their Climate Protection and Zero Waste Plans. Jessica will share her story about the community work she has done in Alameda and throughout the Bay Area and how it has all come together in a creative format of a graphic novel series to inspire people to address and solve climate change through community action and people power. There will be an open discussion for the public to engage in the topic of the solutions to Climate Change with Ms. Robinson, and her guests the City of Alameda staff (who are working on Alameda’s Climate Action and Resiliency Plan) and other community leaders from Community Action for a Sustainable Alameda.